The world is so big, with so much to see. Thanks to StumbleUpon.com, I get a kaleidoscope view. And you can, too! Check out StumbleUpon.com, a powerful website sampler offering a grab-bag of souped-up, search engine surprises. The free service matches your personal preferences and interests to thousands of websites and blogs, many of them obscure little treasures you would have never found on your own. When I’m feeling stuck or uninspired (or avoiding the laundry, the bills, the deadlines looming), I stumble for a creative restart. Today’s favorite stumble is Linda Zacks, a New York artist experimenting with art and words to produce an intriguing mash of edge and allure. An accomplished graphic designer and illustrator, Zacks also creates one-of-a-kind handmade books incorporating the art of typography and photography. 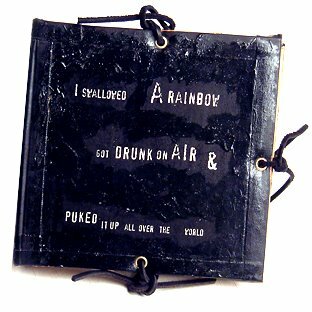 I especially love the way type emerges as an artform in the gritty book (pictured above), "I swallowed a rainbow, got drunk on air & puked it up all over the world." Life is short — but unbearably long when rules and responsibilities slow your step. Go ahead, take some time to stumble around.